Once again Robert Langdon beckons us to go on a journey of discovery with him much like The Doctor of Doctor Who. Except this time we are not the companion. We are Robert Langdon himself. That is how Dan Brown has decided to shake up his well known formula in the Robert Langdon series. Previously in the other books religion was the main topic of exploration with hidden symbols. In The Lost Symbol there was a slight shift in this idea leaning more slightly into the political arena. Now with Inferno there is a wonderful blend of religion, politics, and philosophy. 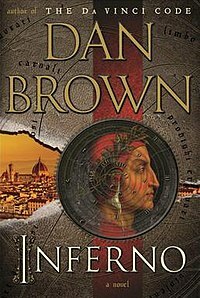 In Inferno Dan Brown takes his cue from Dante’s Divine Comedy in which he asks his reader actually to think on a broader scale. Our journey begins not as Robert Langdon, but as a shadow. Someone is chasing after us before we decide to become a martyr. A martyr for what exactly you may ask. Before we can find out though we wake up as our hero Robert Langdon. Something has happened, and we not sure of what it is. Clearly we have woken up in the middle of something, but what exactly is the problem. This is how Dan Brown has turned his reader into his main character. We are now in the same position as Robert, and as we go on we follow in the footsteps as Dante with Dan Brown as our Virgil. Soon the fog, and the nightmarish images leave our eyes as we become more aware of our surroundings. We meet another important character as she will accompany us on our journey. Sienna Brooks is a doctor who has been treating us, and informs us that we have been shot as well as mumbling “very sorry.” This confuses both Robert, and us as we wonder what strange events have occurred. What is Robert sorry for? Robert ever being knowledgeable of symbols belonging with a city realizes looking out the window our story begins in Florence, Italy. As the reader we ask why is he in Florence. Well apparently Robert does not know himself, or at the very least does not remember due to amnesia. Our hero is told he is carrying a canister that bears the bio-hazard symbol on it, and it can only be activated by a fingerprint. Sienna thinking Robert is into something huge asks why he holds such a thing that can only be opened with his fingerprint. Without having so much as a chance to gather our thoughts though we are once again chased, and being shot at. Sienna grabs Robert, and escapes to her apartment with the bio-hazard canister in tow. The canister is not what it seems though as Robert opens it up at Sienna’s home to reveal an engraved object with the image of a three headed Satan on it. Eventually Robert figures out this mysterious object is in fact a projector. Robert shakes it enough, and the image of Dante’s hell appears on the wall. It is an image that is similar to a nightmare the reader saw before waking up. The symbols fall into place as Robert figures out what he must do even if he does not remember exactly why he must do it. The journey soon becomes a fast paced one as we race through Florence. It is in the middle of everything we find out why there is a sense of urgency. A madman has bio-engineered a plague, and has threatened it will be released by a certain date in a certain location to reduce the world’s population. Here is where the philosophy comes into the novel. Overpopulation is a very real event happening even as this review is typed up. It has been addressed before in various forms of media under different subjects from The Matrix to The Day After Tomorrow. What this mad scientist proposes is to allow disease to reduce the population so the rest of humanity can thrive, and enter a new era. This man points to the Black Death in the Dark Ages as a shining example of how the world went from overpopulated, and on the brink of collapse to one of the most celebrated ages in history. Even though it is a pressing issue Robert is still bent on stopping the plague from ever being released. Whether or not he succeeds I leave to the reader to find out. Over all Inferno is another wonderful novel by Dan Brown that leaves us breathless. To those who realize it Dan Brown has taken you through all Dante’s epic poem. It is generous with explanations of Dante’s Divine Comedy for readers who have not read Inferno, Purgatorio, and Paradiso. Yet it also makes those who have not read The Divine Comedy want to explore all three worlds with Dante. Long ago when I was a child I read Inferno, and was captivated by it. Dante’s hell is were we get our modern idea of hell after all. Now I think the time has come I climb Mount Purgatory to reach Paradise. Dan Brown’s Inferno is out now, and will be adapted into a movie by Ron Howard with Tom Hanks as Robert Langdon said to be released by winter of 2015.